An encounter. Quiet, solitary Russell (Tom Cullen) sleeps with Glen (Chris New) after noticing him in a club, and two of them spend the weekend together. The few days they share are spent largely in hungover, hungry conversation, and it is this naturalistically-played series of exchanges that makes for the potent draw of WEEKEND. Glen, we learn, is doing an art project on the sexual experiences of gay men, and, in bed the morning after the night before, he opens a tape recorder and records Russell’s tentative description of their encounter and questions his thoughts and intentions around it. When Glen switches off the recorder, this confessional discussion continues for the next forty-eight hours. We discover that Russell is mostly settled and reticent in his behaviour whereas Glen is restless and confrontational and angry at a public that he predicts will pay no attention to his project and the queer truths it offers. During this time, writer/director Andrew Haigh stays the camera on his leads, watching them from the coffee table or above the bed, letting the talk and the characters work their ordinary magic. Though Russell and Glen never feel quite symbolic, they are particular – each having been able to act repeatedly on his desires from a young age, in the context of a certain city culture – and, in its strength, their story never feels like an overshadowing of the spectrum of our own poignant routes and experiences. There is space enough for any of us here. As it will, the pair's weekend draws to a close, and the spell runs its course. What of this unexpected relationship? What of love and its queerness? A beautifully measured ending, with the sound stripped away at a crucial point, maintains the unostentatious style the film clings to. Glen’s project, which is ultimately Haigh’s own, emerges then as a quiet and involving success. WEEKEND played SXSW, London and many other festivals this year. It opened in the US in September, in Germany in October and is currently on release in the UK. 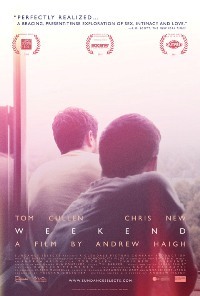 It won the Grand Jury Award at LA Outfest; a Special Mention at the Dinard British Film Festival; Tom Cullen won Best Actor at Nashville; Andrew Haigh won the Emerging Visions award at SXSW; Andrew Haigh won the Audience Award at San Franscisco International LGFF; and the Audience Award at the Toronto Inside Out LGFVF.